Engage in “unfettered conversations” with leaders and peers to gain insights on how to sustain energy, keep an open mind, stay inspired, implement change, and develop resilience to make the journey of influencing others more effective and meaningful. Understand how organisations, managers, and leaders can help or hinder talent progression. Explore policy responses to gender issues, including how to drive and affect change. Build connections with like-minded leaders from across the region and establish networks of knowledge, support and influence. 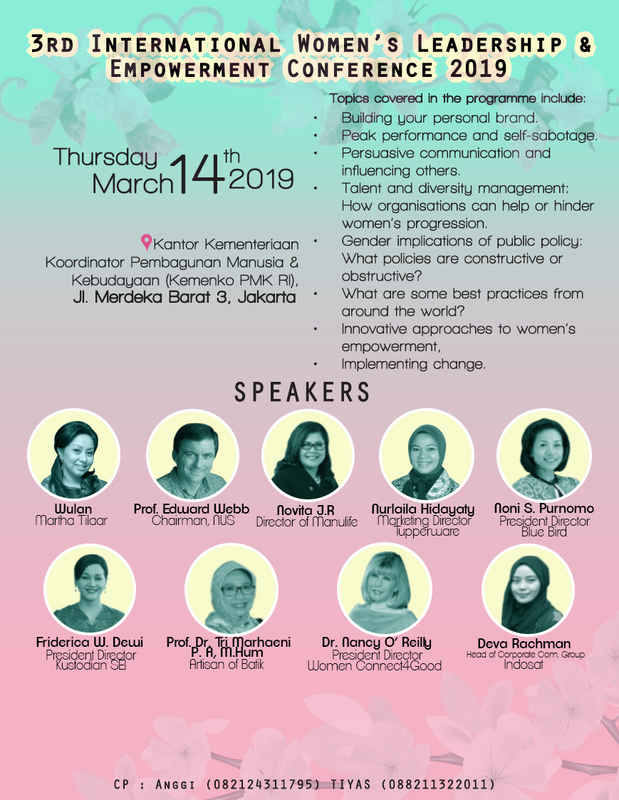 Date: Thursday, March 14th, 2019, Kantor Kementeriaan Koordinator Pembangunan Manusia & Kebudayaan (Kemenko PMK RI), Jl. Merdeka Barat 3, Jakarta, Indonesia. Register Now at Maimilu.com. Limited Tickets!